As a copywriter, the thing that annoys me most in life is when I cannot remember or find something. When I’m overworked and when my head is full of all kinds of nonsense, I tend to have trouble retrieving certain information. It’s on top of my tongue, but I just can’t say it. Sure, like many people out there, I used to carry different notepads and copybooks, but I stopped. Going through hundreds of mottled and poorly organized papers in order to find that special info I needed, proved to be just as annoying and time consuming as sitting helplessly around and trying to force my mind to work normally again. Being a person who is not really keen on piling up junk and walking around with a backpack full of messy papers and reminders, I asked the internet to help me with my organizational troubles. This is how I came across Evernote, one really neat productivity tool. Described by many users as a “second brain”, Evernote is truly an amazing piece of software that helps you keep track of your notes and organize them in a neat and easily retrievable manner. Writing a word, a sentence or a to-do list just isn’t enough for me. As a copywriter, this system really works for me. During the day, I find myself in many situations where a conversation, a story or a gag, give me the much need inspiration for my writing. Sadly, many of these ideas never make it on paper. Why? Because they instantly evaporate from my head if I don’t write them down immediately. It’ not always that easy to write things down. Yes, I use all sorts of reminders, but they don’t really work for me, they’re not that detailed. I’m constantly working with web pages and images that require me to add comments and explain to my clients what I think is and what isn’t working. In order to this, I need to send some pretty exhausting emails, filled with all sorts of long links that tend to get a bit confusing. Thanks to Evernote, these days are over. Apart from just capturing fresh ideas on the go, writing and storing random words in a clean and distraction-free workspace, this tool allows you also to collect web articles, scan handwritten notes, share files, set u reminders and pile up photos with all details in one easily manageable place. In order to create a note, all you need to do is type directly in the app, upload a document or speak into interface. You can do it separately, or you can combine all of these methods in order to create a textual/ audio note with a certain file extension. In order to have everything what my employer said, I tend to record our meetings and brain storming sessions. For me, it’s a lot easier to listen to his words over and over again whenever I please, then to try to memorize everything he said. I also don’t really like going through dozens of emails every time I need certain information, so this audio feature really suits my needs. At the majority of our meetings, we’re talking and writing about our competitors, so next to the audio recording, my Evernote note entries usually need to have a follow up link, or a screen shot if I’m writing about a specific new feature or service. After you’ve captured a note, you can access it from any smartphone, tablet and computer where you’ve installed Evernote. No need to fuss with a thumb drive to transfer notes, images and documents from one device to the next. This program automatically syncs your date and makes it accessible by using a couple of clicks. You never have to worry about where you stored your data again, it’s all right there in the cloud. 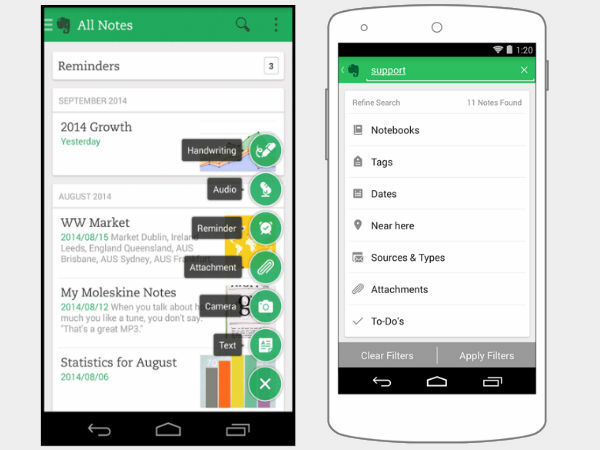 Apart from sharing, Evernote let’s your friends and colleagues edit or comment on your notes. I love this feature because it allows me to create threads and keep specific information independent and locked to certain subjects we’re currently focusing on. I constantly use this when I’m working with my copywriters. I highlight certain paragraphs and add comments, so they know what they need to change in order to close working tasks and move onto new issues. Oh, did I mention that this cool tool also gives you the opportunity to see who, when and how many times has viewed your note? Adding this to its multiple tags selection and email integration, Evernote has presented itself as a pretty reliable project management tool. The use of tags alone lets you ignore the boundaries among notebooks, and group notes together from anywhere in your account. You can sort anything anyway you please. Evernote is a multipurpose intuitive platform that could be integrated with almost every modern device. You can access this tool from almost anywhere and keep your files in sync across multiple devices. It can be used a digital file cabinet, well organized notebook, journal, task or project management system, grocery-list, anything you really want it to be. Some people tend to find it overwhelming and complicated to use, but I think they just haven’t figured out for what purposes they want to use this wonderful software. The more info you put into this tool, the more powerful it becomes. Evernote comes in three packages, Free, Business and Premium, and they all have their special perks. I’ve been using this software for quite some time now and I truly can’t imagine my life without. If you’re like me constantly involved with tons of projects, pitching all sorts of ideas to a bunch of different people at the same time and being frequently bombarded with tons of suggestions and comments, than you should immediately get this tool. Trust me, it’ll make your life a lot easier.